Last month I had the opportunity to photograph a styled bridal session alongside a photographer I greatly admire, Acres of Hope Photography. Words cannot express how excited I was to create these images when I saw the gorgeous model, the amazing setting, and the beautiful florals and styling. The light in this grassy field was just stunning. I was swooning behind my camera as I was shooting and the sun dipped behind the mountains. That light! Truly a dream photo session for me. I am starting to book a few weddings a year and I would love to photograph one in this light and ethereal style. Send an email to rachelmanningphotography@gmail.com to inquire about my rates and availability. Rings by Mere Dreamy Dress by Amsale Bridal Ribbon by Bellame Ribbon Co.
Oh my, this stylized bridal session is perfection! 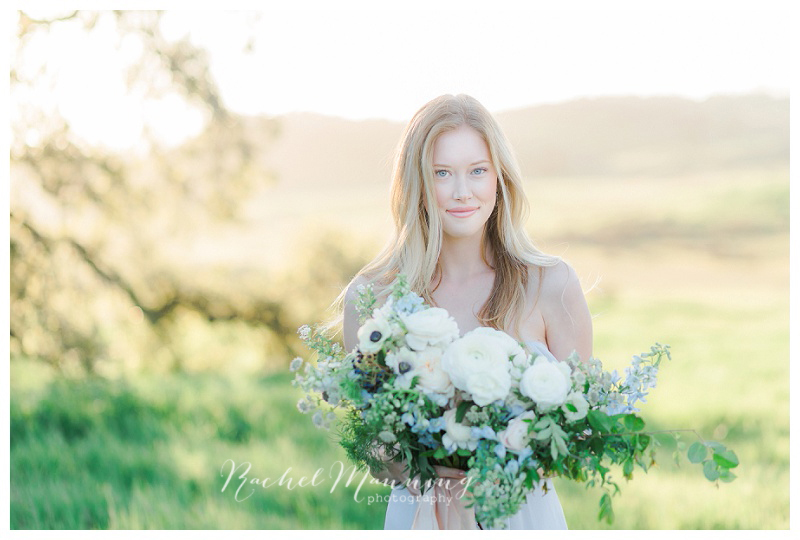 From the stunning bride, dreamy light and amazing location in Ramona.... Gorgeous! What a gorgeous styled bridal session Rachel! So dreamy and light, airy. You really nailed it! This Ramona bridal session is so dreamy - just magical! The mood and lighting is absolutely perfect. I love it! ALL images are so great! the light is amazing! And you captured her grace so beautifully!